Kapoor Oil Mills is the company you can rely on for buying a wide range of Dairy Cow Mats. Our name is highly appreciated among the most reputed Dairy Cow Mats Manufacturers In India because of the unbeatable quality that we offer and satisfied clients we have. All our offered range is prepared at our in-house manufacturing unit with only graded raw materials and the best technology to ensure our clients will never get disappointed. Why Are Dairy Cow Floor Mats Beneficial? Easy To Clean: Due to their weave design and rough and tough texture, they are very easy to clean and don’t require a labour-force for the job. Offer Comfort: The platform of the sheds is quite slippery which sometimes injure the cow and buffalo due to slipping on the floor, but with these Cow Mats, the risk gets reduced. Also, it offers them a great level of comfort which is hard to obtain on a dirty floor. Enhance Productivity: The use of these mats offers a great level of comfort to the animals, which increase productivity. We offer a comprehensive line of Dairy Cow Rubber Mats that is widely demanded by numerous clients. 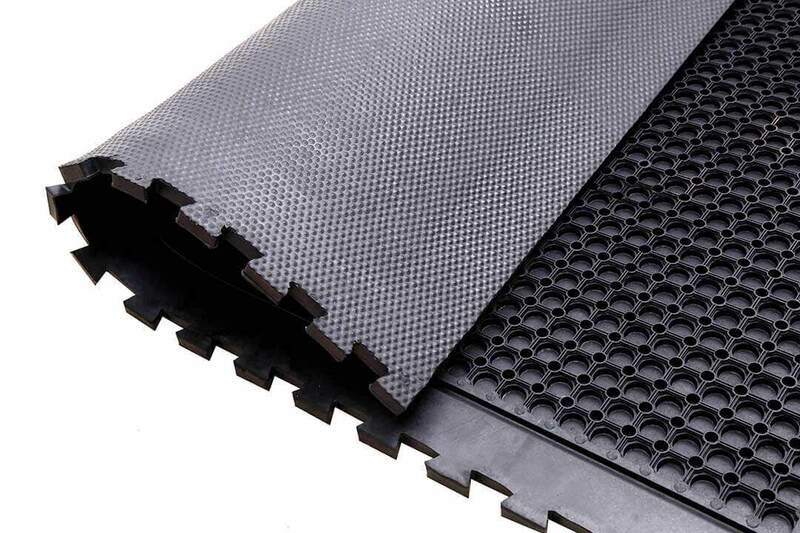 This kind of mat is designed specially for providing insulation against coldness and enhancing comfort level for cattle. Being shock proof, it reduces risk of injury. Also, it reduces the risk of spilling as well as falling due to anti-slippery surface. Easy to clean and maintain, these are made out of grade-A vulcanized rubber. These Dairy Cow Floor Mats are made available in varied designs, thickness, weight and with black color to choose from. Be it Cow, Buffalo or Cattle Mats, we have all the options available to meet the diverse need of the customers according to their industry. Our prices are quite sensible in the market and will offer you value for money. Being one of the most reputed Dairy Floor Mats Exporters and Suppliers In India, we give all our clients assurance that they will get the timely delivery to their doorstep. Drop an email or call directly to place an order or enquire more.